Great game for young children. The activities are fun and educational and WALL-E is adorable. WALL-E for the Leapster is the go-to game if your fan is between 4 to 7 years of age. The console version of the game (reviewed below) is just too challenging for this age. With the Leapster game, kids help WALL-E find cool human gadgets to play with by playing five educational games. 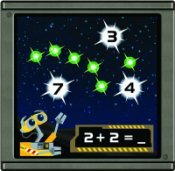 In one, while kids star-gaze with WALL-E, they practice number identification, addition, and subtraction to find star patterns in the sky. Then they connect the stars to learn about famous constellations. The games, which teach letter recognition, spelling skills, and math, can be played on three levels of difficulty. In addition, kids will learn facts about recycling by helping WALL-E recycle trash. The visuals on this system do a great job of capturing the charm that is WALL-E. As in the movie, kids will love watching his antics.